Race Ramps Show Mirror UNIVERSAL - Dezod Motorsports Inc - Home of the automotive performance enthusiast since 2002. Use our Show Mirror to give the spectators and judges the most impressive view of the underside of your car. The large, acrylic flex mirror is mounted in a lightweight, durable frame that provides a rugged, yet stylish package. With a specially-designed travel cover that fits securely over the mirror, it’s never been easier to use, transport, and store a mirror. There is no worrying about it breaking, and it weighs under 30 lbs. 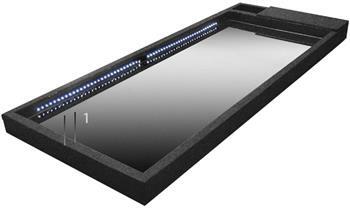 The Show Mirror provides a 48″ by 20″ footprint for a large under-vehicle viewing area. Use it with Race Ramps’ Show Cribs, Show Ramps, or the Portable Pit Stop Ramps for a stunning display. The mirror is also available with battery-operated LED lights which illuminate with a vibrant white light.